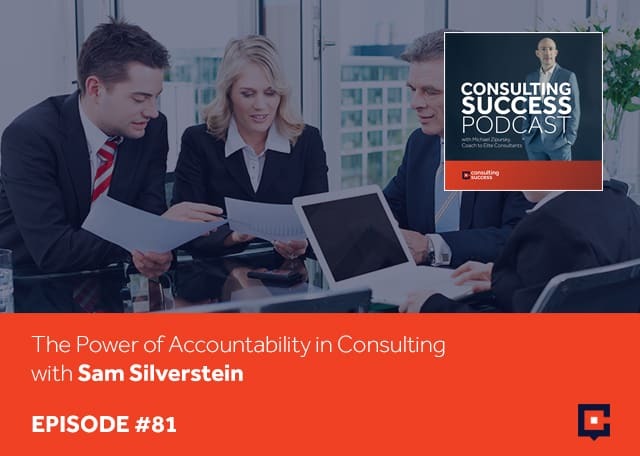 Accountability expert, keynote speaker, and author Samuel Silverstein aims to continually cultivate accountability in diverse organizational cultures. When he left the corporate world and sold his business, he started to hasten skills in writing, speaking, and consulting. His consultancy field was mainly driven by his expertise in speaking in front of a variety of people and various organizations. He is also a bestselling author of seven books. Today, he is dedicated to empowering people to live accountable lives and renovate the way they do business through effective ways of generating leads and building relationships. Samuel goes deep into the power of accountability, what it really means, and why it’s important for consultants, business owners, and leaders to understand it. I’m excited to have Sam Silverstein joining us. Sam, welcome. It’s great to be here, Michael. For those who aren’t familiar with your work, take a moment and explain what you do. I’m an author, a professional speaker, a consultant. I work with organizations around building a culture that inspires accountability. Your clients have included Pfizer, RE/MAX, Kraft Foods, Aflac, Mayo Clinic, the list goes on. Looking at who your clients had been over the years, it’s a significant list in many different industries. How did you go about building such a diverse group of clients? Many consultants focus on specific industry or area where they build their brand, but your clients had been varied and wide-ranging. How did you get to that place? It follows the model for my business, which is the consulting work that I do is driven by my speaking work. I speak in front of a variety of clients and then from there, it opens the doors for me potentially or possibly to consult. A lot of those clients that you see in there quite frankly are clients that I’ve spoken for that I may or may not have consulted with. I don’t want that to be misleading in any way, shape or fashion. As a speaker, I have the opportunity to be in front of a diverse set of organizations because I don’t focus on industry. I focus on the topic. My topic is accountability and specifically accountability as a derivative of creating a certain type of organizational culture. That’s what drives everything I do. All my writing, all my books, all my speaking, that front end of my business and my assessment tools hopefully then yield and connect to some consulting and development opportunities with clients. Let’s talk about your offerings. What gets you at the table or gets you in front of ideal clients is the speaking. That’s the initial engagement. From there, in certain cases, some of them might say, “Can you also consult with us and for us?” What does that look like? Take us through one example that you can share. How did it go down? You’re up there on stage. You’re giving your talk and then what happens from that point? Do you have a choreographed sequence or steps that you follow as part of your process to make that next offering to a prospective buyer? Does it happen? They say, “Can you consult for us?” What’s your approach to that? It is probably the greatest challenge I face converting a speaking opportunity into a consulting opportunity. Many times, when they’re hiring me to speak, it’s someone that may be meeting professional in an organization. They’re planning a two-day conference and they’re looking to fill the 9:00 until 10:00 spot on the first day. They don’t get on that. That’s not their area of responsibility. They’re not connected to it. They’re not the CEO. They’re not the ones that have to implement and make it happen afterward. Therein lies the challenge. There’s one of two ways. 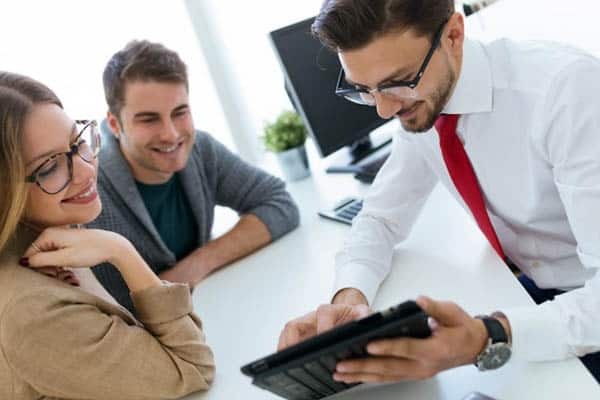 If I have the opportunity on the front end when I’m putting the job together to speak with someone who has the ability to purchase the consulting, then I try to connect to it early on. Come in and speak with a cross-section of your people and then debrief with so that you know how to address these issues in real time as well as use that information in my speech. In that situation, he went nuts and he jumped on it. I turned that speech into a speech plus a small consulting opportunity. I’ll do it that way. The other way is when I’m on site and I have the opportunity to meet the individual in the organization that can use my services. 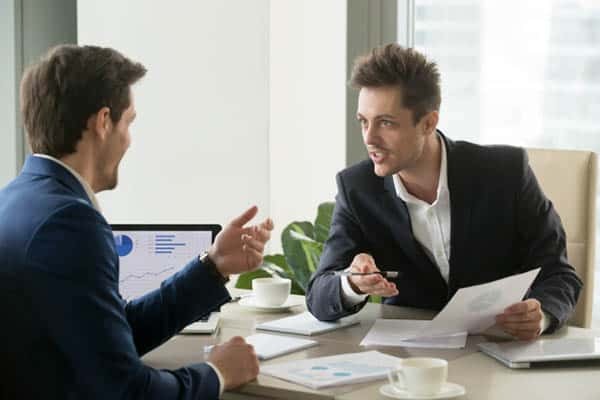 I’ll ask him a simple question, “Would you like to discuss a little bit further how to take what we talked about now and make it happen in your organization?” If they say yes, then that’s going to start a conversation. Sometimes I use my assessment tool as a way to open that door or as a starting point. It depends on the client. You offer two great examples and even some wording that those in our audience can implement themselves. What about in the situation where you are speaking in front of an audience? You don’t have time to make that offer around the consulting piece. How do you handle follow-up? 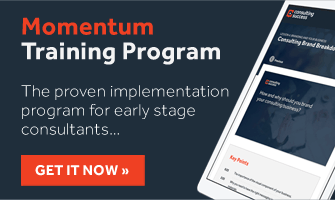 What have you found in terms of some best practices to be able to land additional business whether it’s additional speaking opportunities, consulting engagements or assessment tool offerings with those you’ve spoken to? Have you found a good way to manage that? It seems like they want to talk to you all. They’ll give you whatever you want up until that speech. After the speech, often they’re moving on. The key ingredient here is the relationship. How close of a relationship? How well can you connect with that person that you’re trying to connect with? If the message resonates and you can connect with them on a deeper level not just on the surface, and if there’s a real need then that intersection of all of that enables you to follow-up, that follow-up may come in the form of a phone call. It might be an email that’s setting up a phone call. There has to be clarity in what your offerings are. What you’re going to offer the client? What can you do for the client? How might you be of service or value to the client? It’s always based on their needs. Let’s talk about accountability here. It’s at the core of your messaging. What does accountability mean to you? Why is it important for consultants and business owners and leaders to understand it? It’s a term that’s thrown around a lot these days, probably not truly understood or acted upon by many. I’ve written seven books on this. I’ve done a tremendous amount of research and case studies. I worked with clients on it. I’d like to think I know what I’m dealing with. At the same time, it seems every year I’m always learning more. What I’ve discovered is that everything we’ve been taught about accountability is wrong. Accountability is not a way of doing, which is the way most people see it. Accountability is a way of thinking and specifically, it’s how we think about our people. A lot of time, leaders use accountability to try and manipulate their people to do more. That’s not what accountability is. The old expression, “I hold my people accountable.” That will never work. That’s like putting a gun to someone’s head. The truly great leader helps their people be accountable. As you can imagine, that’s a different relationship. If I know you’re helping me be accountable, if I know you’re helping me achieve my goals, if I know you’re helping me succeed, then all of a sudden there’s a different bond between me and you. That different bond is going to create a scenario, an environment where I want to be accountable. As soon as that happens, the game changes. I define accountability specifically as keeping your commitments to people. There are always people involved. There are always relationships. Those commitments aren’t showing up at 9:00, getting the report done by 3:00, cleaning up where you’re supposed to clean up. Those are your responsibilities. If you’re not doing your responsibilities, you should be fired. It’s that simple. Why would you keep paying someone that’s not doing what they’re supposed to be doing? The real commitments are from leaders to their people based on things like a commitment to live the values. A commitment to stand by you when all hell breaks loose. A commitment to my word is my bond. Many of these commitments are commitments that are never spoken. They must be taken on by leaders if they’re going to build that deeper and more meaningful relationship and create an organizational culture that inspires accountability. Many of us have found ourselves in this situation at one time or another or at least work with people who know what they need to do. They have a clear end goal or results in mind. They know even the steps they should be taking to get there but they hesitate to take action. They hesitate to implement. What have you found is an effective way to support those people to help them to do what they say that they are going to do or do what they know that they should do? Now we’re talking about procrastination more than accountability in my opinion. What’s the difference, in your mind, between procrastination and accountability? How do you define them? Accountability is keeping your commitments to people and procrastination is the inability of someone to get off the mark. They’re putting things off for one reason or another. They don’t know what they fundamentally believe. If I’ve promised to deliver something to you by tomorrow afternoon, I’ve got a report or we’ve had a meaningful conversation and I said, “I’ll have the proposal to you tomorrow by 3:00.” If I don’t get that to you on time, what do I believe about respect? What do I believe about my word is my bond? What do I believe about the relationship between people, how you see people, how you treat people? That’s what’s at play. I respect people. If I’m not getting you that on time, that’s totally disrespect for you, for your timetable, for your needs, for your concerns. There’s a value situation that has to be in place, whether it’s an organization dealing with organizational values or you and me dealing with our own personal values. Until we get a handle on that and truly know what we believe, then we’re not going to ever make decisions that are consistent. We’re not going to follow-up. We’re not going to live what we say we’re going to do. I’ve witnessed many people who don’t do those things, who says they’re going to do something and then don’t follow-up as a promised or don’t show up as promised or miss a meeting or whatever it might be. I’d love to get your perspective on this because there are plenty of examples of people who are successful. They have built successful businesses. They have high incomes or high net worth or whatever you want to define as a success that society might put out there. Yet, these same people on many occasions don’t show up for meetings on time or don’t do what they say that they’re going to do. Some of them might look at it and say, “It doesn’t hurt them,” yet when I look at that I go, “Even if it doesn’t hurt them directly, why would they want to live that way?” That for me is a values thing. What are your experience and your perspective on those who are, “Successful,” but don’t adhere to necessarily those same values and don’t honor their word the way you and I would expect that people should? You can be financially successful and not be a nice person. You don’t have to be a nice person to be financially successful. You can be unethical and be financially successful. You can be incompetent in this world that we live in and be financially successful. When you say successful, you’re talking about financially successful. You can be financially successful and break all the rules, but that doesn’t mean that you’re living the life that you should be living. One of my commitments is a commitment to a good reputation. A leader maintains a good reputation for themselves and for the people they lead. If you’re my leader and you have a good reputation, a good reputation also umbrellas over me and you’re inspiring me to want to protect that reputation. If you don’t have a good reputation, then that also reflects on me and how the world market or people see me. The fact that someone’s financially successful doesn’t mean that they’re accountable. It doesn’t mean that they’re contributing to the community. It just means that they’re making money. That’s all it means. Bill Gates quoted Warren Buffett and that’s not bad company anyway around it. Their measure of success is at the end of the year. They’re not talking about financial numbers. They were talking about personal relationships. I want to build a business around relationships. I want people to say that when Sam said he was going to do something, he did it. I want people to say, “Sam cares about the community that he lives in and it’s not just about the pocketbook.” I want people to say, “Sam doesn’t give back. Sam gives.” Giving back connotes a condition. You gave to me, therefore I give to you. I want to give first. I don’t want to give because I feel obligated to give back. There’s nothing wrong with giving back, but I would rather initiate the give because I feel it’s the right thing to do. I want people to say, “Sam goes into communities and contributes his time and energy and teaches about accountability, even in scenarios where he’s not being paid because he believes truly in his heart that’s what his mission is.” Those are the things that I want out. If I believe that, then at the end of the day I have to look in the mirror and say, “Where are my actions lining up with that?” If they’re not lining up with that, then there’s hypocrisy. That’s where all that comes in. Am I keeping my commitments to people on a meaningful level but also on a surface level, the transactional stuff? That’s the easy stuff. Between you and me, if you don’t keep your commitments to me in the transactional stuff, I’m not going to do business with you, because that’s a lack of character. This is core stuff. This is not just tactics or marketing stuff. This is the core of all of us as humans, how we want to be known and our reputation. I want to bring us back to a couple of other things that we can explore together around your business and how you got to where you are now. Speaking is the inroad. It’s the starting point for a lot of what you do with organizations. In order to land those speaking engagements, we talk about generating a pipeline of opportunities and qualified leads that feed your business. What have you found over all your years to be the most effective way to go about generating those qualified leads? It’s not an easy thing to do, but the answer to your question is multifold. First of all, you need to have a great speech that when you do speak, people enjoy it. People find the message significant and meaningful. It’s not abundant. It’s not the same old stuff they hear from everyone else. You deliver it in a way that’s entertaining, that causes people to think. That has emotion involved whether it’s laughter, whether it’s pathos. You have to master that craft independent of being a consultant. That’s where I started. When I left the business world, when I sold my business, I started writing and speaking. That for me came first. I got involved with the National Speakers Association. I’m even a past president of the National Speakers Association. I had a love for speaking and I developed that. You’d have to be great on the platform. The next thing you have to do is leverage off of relationships that you already have. It seems we want to get away from those industries, those niches that we were known in, but leverage off of those relationships. Create an abundance of content. Every week on LinkedIn, you can find me. Every week I post an article, I post a video. I’m always creating content and creating ideas and putting it out there. I try to keep my website up to date and engaging so people can find me that way. The other thing to do is market to associations. First on the state level then on the national level. If you can get in and speak to associations, usually in an association meeting everyone there is from an industry. You then have the ability to potentially speak to all those individual companies or you have the ability to take that association presentation and turn that into consulting opportunities with all the members of the association. How do you reach out to associations? Is it a letter? Is it an email? Is it a phone call? How are you making that contact? What does that initial contact say? A quick outline, if you could offer one. What is the approach you’ve found to be effective with that? There are multiple ways of doing it and we’ve done it all. First of all, you have to understand like anything else, they’re getting bombarded. I’m not the only one that wants to speak. There are more than two others. They are getting flooded, but we have called. I have emailed and had links in the email. We do research. We find the organization. We find out when your meeting is. It’s all out on the internet. You look at who they’ve had in the past. You send an email. You reach out. You know when their meeting is. 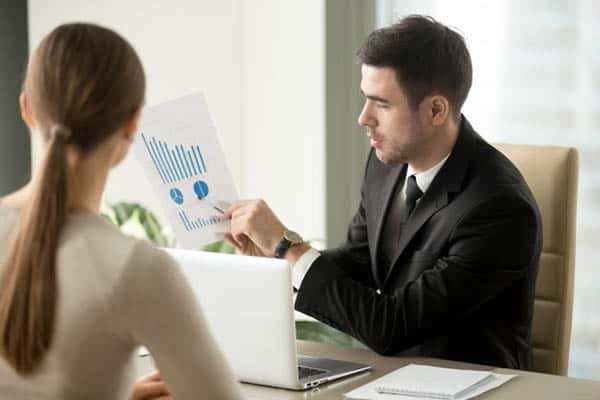 You can assume that several months before the meeting is a good time to start connecting with them. There’s a link in the email to my preview video. We try and encourage them to go look at the video, then we follow-up. We do campaigns where we’ll take one of my books and we’ll send it to the association exec of every state association for a particular niche. There’s a national and then the state level. You have to figure those roughly 50 state levels to go with the individual national level. We might send out 50 books with cover letters and follow-up with phone calls. If I speak at a state level organization and I build a relationship with the executive director or the president, whatever their title is. I’ll ask them, “Can you introduce me to someone at the national level?” Many times, they can. If I speak at the national level, then it gives me the opportunity to be seen by all the state level and they might want to bring me back to all the state level. It’s up and down and it’s a never-ending process. In all of that, have you found one thing that tends to work better than the others? Oftentimes, marketing is a compounding effect. Recommendations or referrals? Referral is by far the best and most impactful way to do it. With the benefit of hindsight, what lesson have you learned that you wish you knew when you were getting started in this business? On the speaking side, I would say speak as often as you can. Speak for free, it doesn’t matter. Get good and get your name out there. I started my career by writing a book and then I took some time off from writing and focused on the speaking. I wish I would’ve stayed with writing more early on. In 2018, we had three books come out. I have a book scheduled for 2019 and a book scheduled for 2020. Why do you wish that? Going back to when you wish you would have done more writing and not jumped as quickly to speaking. Why is that? Not jumped as quickly to speaking but continue to write while I was speaking. When I write, the research, the energy that goes into it causes me to learn, to grow, to develop new content. To become better equipped to help my clients either on the platform as a speaker or in the executive office. The writing has helped me developed taking a message, for instance, around accountability to a depth that I don’t see out there. I don’t know anyone that has the IP on accountability that I do, but I don’t know anyone that has written as much about accountability as I have. My writing has been the equivalent of two PhDs as far as I’m concerned. What is one common mistake do you see consultants make all the time that you know that if they didn’t make it, they would be more successful? Not following through on an incredibly timely basis. A lot of consultants or individuals are in business by themselves. They’re not part of large organizations. For those individuals that are out there where you’ve got the hat rack with fifteen hats on it, then you’ve got to market. You’ve got to sell and you’ve got to be on site and you have to deliver and you have to do the payables and the receivables and you’re doing all that stuff. It’s hard to stay up with everything, but you have to create. You’re responsible to create an organization that is easy for the client to do business with, not easy for you to live with. That’s the first consideration. What support staff do you need? Whether they’re in-house or whether they’re 1099 or they’re part-time or whatever, but what’s your support system? Whoever’s working with you, they need to feel they’re working with a first-class and world-class organization, whether it’s just you or whether there are 50 consultants in the organization. Often, consultants hold off getting assistance, whether it’s in-house or virtual. Trying to do a lot of stuff themselves when a lot of those things can be lower-value tasks are not the right tasks for them to be doing. They could be spending their time on higher revenue producing versus higher value activities. In your case, how soon did you start to assemble or add on that support component of other people to help you? I don’t wish I started doing it sooner because I started day one. I knew what business was and how a business operates. I came from a manufacturing company. I didn’t try to sell all the product, manufacture the product myself, enter the orders into the computer, and send the bills out. I had a team. I had an organization. I had 175 employees that I couldn’t have done what I did without. My partners and I, we had built an organization that had experts at everything. I felt in this business if I was going to build it, the first thing I needed was someone to help market. I brought someone in, got some lists, put them on the phone, and off we went. Not that it’s always been easy. It’s taken a lot of effort. I have an employee, but I have a team behind me. For instance, in my speaking business, I have an agent and my agent has an office with six or seven people that handle everything on the speaking side of my business. I don’t have to deal with anything on that. Once someone says they’re interested from the sale all the way down through the delivery, they manage all that. My clients get world-class service so I can focus on what I want to focus on, which is creating content, discovering new ideas, and then delivering that in the form of value either on the stage or in the C-Suite. 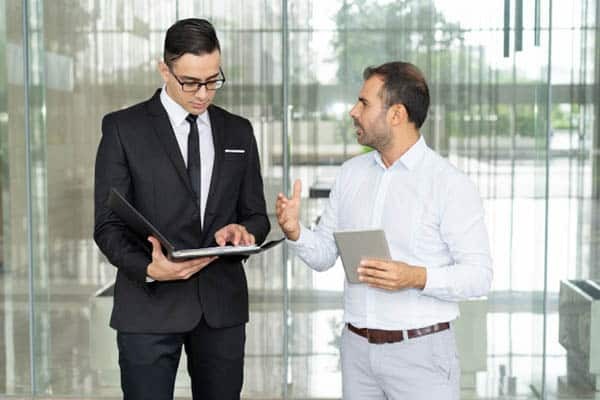 There’s a big difference between being a consultant and being a consulting business owner or an entrepreneurial consultant where you recognize that it’s a business. It’s not just about doing the work. There are other things that need to happen to be able to create the work that you can do and showcase your experience and expertise. Sam, I want to thank you for coming on and sharing some of your story and wisdom here with us. I want to make sure that people can learn more about you and your work, read your articles, see the videos and so forth. What’s the best place for people to go to learn more about you? The first and best place probably is the website, which is SamSilverstein.com or BeAccountable.com will take you there as well. I love connecting with people on LinkedIn and there’s a lot of information that’s put there, and that’s Sam Silverstein. Sam, thanks so much for coming on. It’s been my pleasure. I hope the information was of service to you and your audience. Anytime I can be of assistance, reach out to me.